Burbach, Frank R. 2018. Family therapy and schizophrenia: a brief theoretical overview and a framework for clinical practice. BJPsych Advances, Vol. 24, Issue. 04, p. 225. Li, Chao-Yin and Murray, MaryAnne 2015. A review of conceptualisation of expressed emotion in caregivers of older adults with dementia. Journal of Clinical Nursing, Vol. 24, Issue. 3-4, p. 332. Sher-Censor, Efrat 2015. Five Minute Speech Sample in developmental research: A review. Developmental Review, Vol. 36, Issue. , p. 127. Brezis, Rachel S. Weisner, Thomas S. Daley, Tamara C. Singhal, Nidhi Barua, Merry and Chollera, Shreya P. 2015. Parenting a Child with Autism in India: Narratives Before and After a Parent–Child Intervention Program. Culture, Medicine, and Psychiatry, Vol. 39, Issue. 2, p. 277. Roseliza-Murni, AbRahman Oei, Tian P.S. Fatimah, Yusooff and Asmawati, Desa 2014. Schizophrenia relapse in Kuala Lumpur, Malaysia: Do relatives’ expressed emotion and personality traits matter?. Comprehensive Psychiatry, Vol. 55, Issue. 1, p. 188. Zanetti, Ana CG Wiedemann, Georg Dantas, Rosana AS Hayashida, Miyeko de Azevedo-Marques, João M and Galera, Sueli AF 2013. Cultural adaptation and psychometric properties of the family questionnaire in a Brazilian sample of relatives of schizophrenia outpatients. Journal of Clinical Nursing, Vol. 22, Issue. 11-12, p. 1521. Michelson, Daniel and Bhugra, Dinesh 2012. Family environment, expressed emotion and adolescent self-harm: A review of conceptual, empirical, cross-cultural and clinical perspectives. International Review of Psychiatry, Vol. 24, Issue. 2, p. 106. Chakrabarti, Subho 2011. Family interventions in schizophrenia: Issues of relevance for Asian countries. World Journal of Psychiatry, Vol. 1, Issue. 1, p. 4. Galera, Sueli Aparecida Frari Zanetti, Ana Carolina Guidorizzi Ferreira, Gabriela Cristina da Silva Giacon, Bianca Cristina Ciccone and Cardoso, Lucilene 2011. Pesquisas com famílias de portadores de transtorno mental. Revista Brasileira de Enfermagem, Vol. 64, Issue. 4, p. 774. Park, Mijung and Chesla, Catherine (Kit) 2010. Understanding Complexity of Asian American Family Care Practices. Archives of Psychiatric Nursing, Vol. 24, Issue. 3, p. 189. Karamlou, S. Mottaghipour, Y. and Mazaheri, M.A. 2010. Expressed emotion, family environment, family intervention and the psychiatric relapse of patients with severe mental disorders in Iran. International Journal of Culture and Mental Health, Vol. 3, Issue. 2, p. 137. Kulhara, P. Chakrabarti, S. Avasthi, A. Sharma, A. and Sharma, S. 2009. Psychoeducational intervention for caregivers of Indian patients with schizophrenia: a randomised-controlled trial. Acta Psychiatrica Scandinavica, Vol. 119, Issue. 6, p. 472. Park, Mijung and Chesla, Catherine 2007. Revisiting Confucianism as a Conceptual Framework for Asian Family Study. Journal of Family Nursing, Vol. 13, Issue. 3, p. 293. Rosenfarb, Irwin S. Bellack, Alan S. and Aziz, Nahid 2006. Family interactions and the course of schizophrenia in African American and white patients.. Journal of Abnormal Psychology, Vol. 115, Issue. 1, p. 112. Kwon, Julie Delaney‐Black, Virginia Covington, Chandice Abell, Steven C. Nordstrom‐Bailey, Beth Sokol, Robert J. and Ager, Joel 2006. The relations between maternal expressed emotion and children’s perceived self‐competence, behavior and intelligence in African‐American families. Early Child Development and Care, Vol. 176, Issue. 2, p. 195. Rosenfarb, Irwin S. Bellack, Alan S. Aziz, Nahid Kratz, Katherine M. and Sayers, Steven 2004. Race, Family Interactions, and Patient Stabilization in Schizophrenia.. Journal of Abnormal Psychology, Vol. 113, Issue. 1, p. 109. Austin, JC and Honer, WG 2004. The potential impact of genetic counseling for mental illness. Clinical Genetics, Vol. 67, Issue. 2, p. 134. Ohaeri, Jude 2003. Current Opinion in Psychiatry, Vol. 16, Issue. 4, p. 457. Expressed emotion: A cross-culturally valid concept? Brown, G. W. & Rutter, M. (1966) The measurement of family activities and relationships: methodological study. Human Relations, 19, 241–263. Brown, G. W., Monck, E. M., Carstairs, G. M., et al (1962) Influences of family life on the course of schizophrenic illness. British Journal of Preventive and Social Medicine, 16, 55–68. Brown, G. W., Birley, J. L. & Wing, J. K. (1972) Influence of family life on the course of schizophrenic disorders: a replication. British Journal of Psychiatry, 121, 241–258. Butzlaff, R. L. & Hooley, J. M. (1998) Expressed emotion and psychiatric relapse. Archives of General Psychiatry, 55, 547–552. Cheng, A. T. A., Tien, A. Y., Chang, C. J., et al (2001) Cross-cultural implementation of a Chinese version of the Schedules for Clinical Assessment in Neuropsychiatry (SCAN) in Taiwan. British Journal of Psychiatry, 178, 567–572. El-Islam, M. F. (1982) Rehabilitation of schizophrenics by the extended family. Acta Psychiatrica Scandinavica, 65, 112–119. Hsu, F. L. K. (1973) Kinship is the key. The Center Magazine, 11 (6), 4–14. Jenkins, J. H. & Karno, M. (1992) The meaning of expressed emotion: theoretical issues raised by cross-cultural research. American Journal of Psychiatry, 149, 9–21. Kavanagh, D. J. (1992) Recent developments in expressed emotion and schizophrenia. British Journal of Psychiatry, 160, 601–620. Leff, J. & Vaughn, C. (1985) Expressed Emotion in Families: Its Significance for Mental Illness. New York: Guilford Press. Lin, T. Y. & Lin, M. C. (1980) Love, denial and rejection: responses of Chinese families to mental illness. In Normal and Abnormal Behavior in Chinese Culture (eds Kleinman, A. & Lin, T. Y. ), pp. 387–401. Boston, MA: D. Reidel. MacMillan, J. F., Gold, A., Crow, T. J., et al (1986) The Northwick Park study of first episodes of schizophrenia. IV. Expressed emotion and relapse. British Journal of Psychiatry, 148, 133–143. MacMillan, J. F., Crow, T. J., Johnson, A. L., et al (1987) Expressed emotion and relapse in first episodes of schizophrenia. British Journal of Psychiatry, 151, 320–323. Phillips, M. R. & Xiong, W. (1995) Expressed emotion in mainland China: Chinese families with schizophrenic patients. International Journal of Mental Health, 24, 54–75. 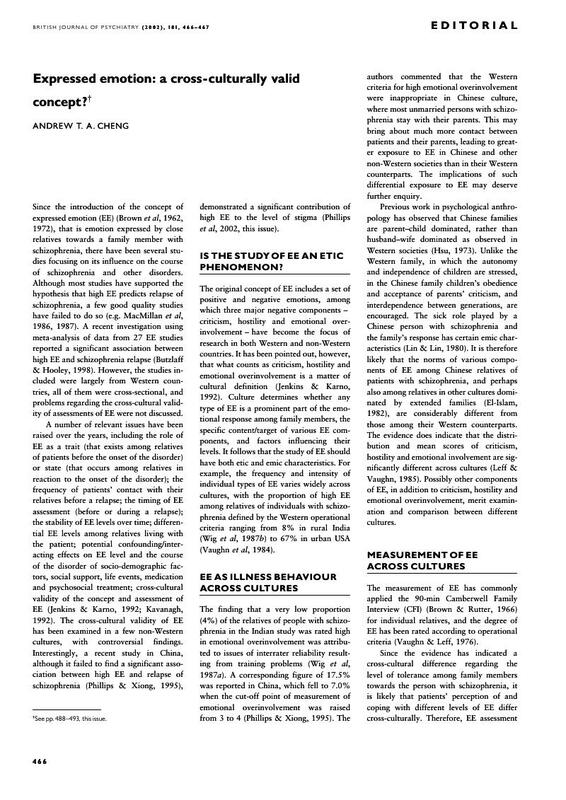 Phillips, M. R., Pearson, V., Li, F., et al (2002) Stigma and expressed emotion: a study of people with schizophrenia and their family members in China. British Journal of Psychiatry, 181, 488–493. Vaughn, C. E. & Leff, J. (1976) The measurement of expressed emotion in the families of psychiatric patients. British Journal of Social and Clinical Psychology, 15, 157–165. Vaughn, C. E., Snyder, K. S., Jones, S., et al (1984) Family factors in schizophrenic relapse: replication in California of British research on expressed emotion. Archives of General Psychiatry, 41, 1169–1177. Wig, N. N., Menon, D. K., Bedi, H., et al (1987a) Expressed emotion and schizophrenia in north India. I: Cross-cultural transfer of ratings of relatives' expressed emotion. British Journal of Psychiatry, 151, 156–160. Wig, N. N., Menon, D. K., Bedi, H., et al (1987b) Expressed emotion and schizophrenia in north India. II: Distribution of expressed emotion components among relatives of schizophrenic patients in Aarhus and Chandigarh. British Journal of Psychiatry, 151, 160–165.